« Blinging up Eve’s Sandals! I have a super easy card to show you today, and the best part is that it is as gorgeous as it is easy to make! 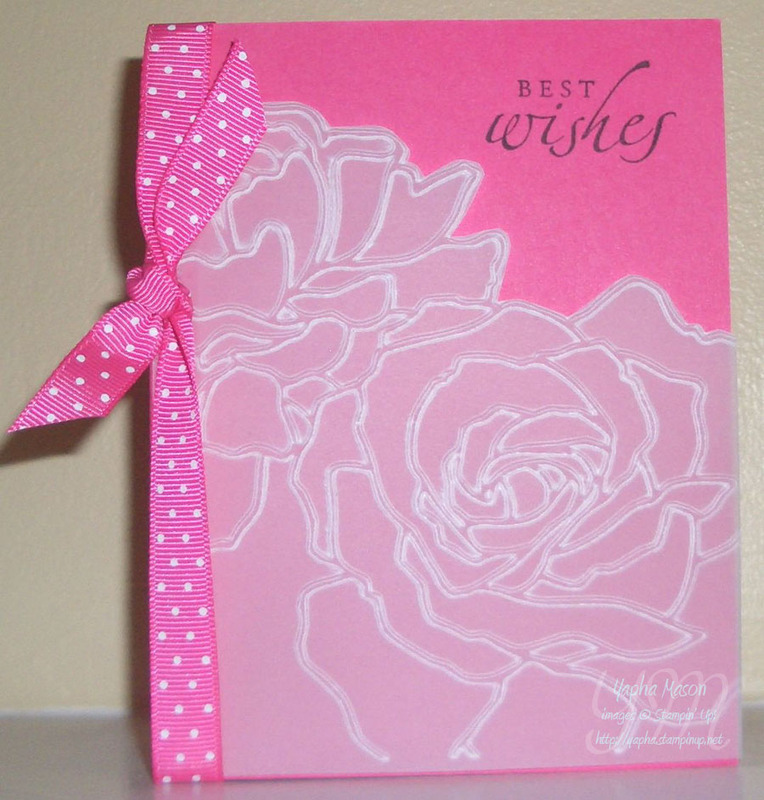 I got the idea from these beautiful cards on Gretchen Barron’s blog. These feature what may be my very favorite of the new In-Colors, Melon Mambo. One important thing to note is that the directions on the Manhattan Flower Textured Impressions embossing folder incorrectly state that it should be run through the Big Shot using Tab 2 on the multipurpose platform. You need to use Tab 1 on the multipurpose platform with this folder. If you use Tab 2, your sandwich will be too thick to run through the Big Shot. The trick with using vellum is to find a way to hide the adhesive. I used a strip of SNAIL down the left side of the vellum. It is hidden underneath the ribbon. We made this beautiful card at my last workshop at Paula’s house. Everyone loved the simple elegance, and they were all amazed at how quick and easy it was to make!